August | 2008 | Wait... What? The groups all worked again today finishing things up. The IT person from the Program Unit office is still here trying to resolve the issues with the computers. He fixed the USB port on the one and is going to purchase a CD player for each computer so that the software can be installed. The Program Support manager visited today with the advocacy coordinator from Plan Canada. It’s very clear that there will be good follow up from the Rwanda office on everything coming out of the project. 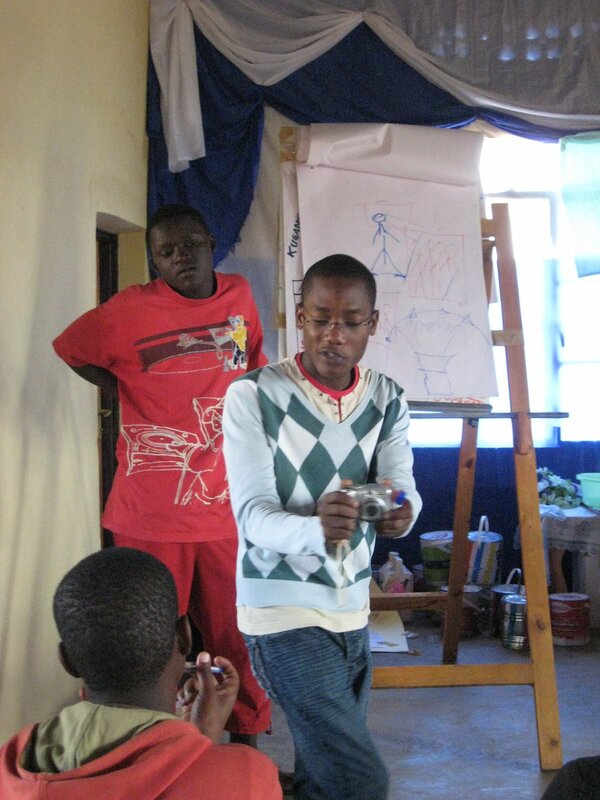 The Program manager was quite keen on the ideas that the kids and partners have come up with and commited to building Plan’s interventions around the topics/issues coming out from the kids’ work. We worked until 3 and then I said goodbye to the kids. They gave me some really sweet drawings and letters to take home with me. Chrystel and I stayed at the hotel until around 6:30 and then we drove back to Kigali where I checked back into the Ninzi Hill Hotel and took my first hot shower with running water in the past 2 weeks – that sure felt good! I got online to check in on my other life, and almost immediately Julie Skyped in and said that she was having trouble getting passports and visas sorted out for Noe (her small son who was supposed to come with her for the last week of training). It sounded like a big hassle for her to try to sort it out, so we agreed that she would not come. I felt that the team was really on track anyway, and didn’t require us anymore. I think the important thing is the first week or 2 and by then things just roll along. Julie said the same thing happened with the Senegal training, so we agreed she’d cancel her trip. Though she was disappointed, I think it will be OK.
Around 10:30 Jacques and Olivier came to pick me up to go hear some live reggae at the KBC (Kigali Business Club). Really nice place and good music. We stayed pretty late and then walked back to the hotel and I crashed. 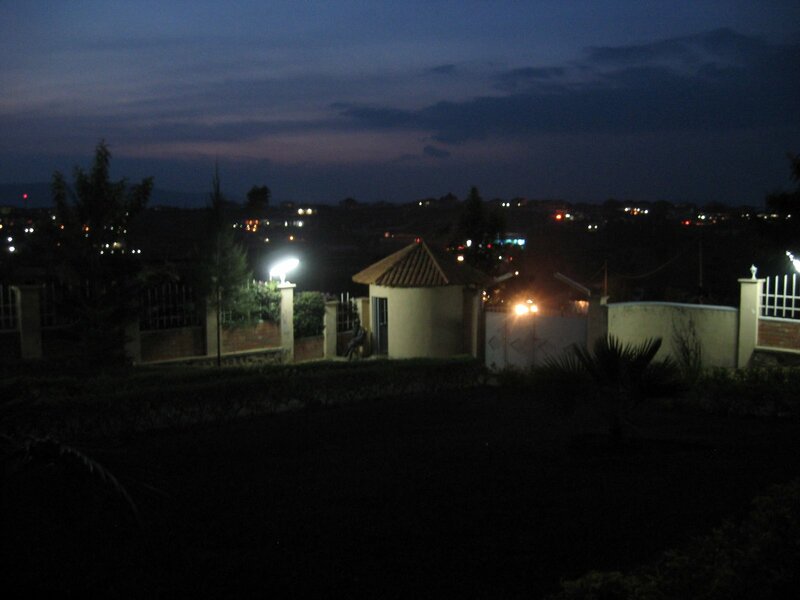 Photo: Kigali by night. Olivier, Joseph and Tony came in the morning to say goodbye. Chrystel took me to the airport around 2:30, (stopping on the way to pick up some Waragi to take home as a souvenir)! My flights home were uneventful. I think I slept for about 16 hours! Picked up some coffee in Ethiopia airport and made it home to my house around noon on Sunday. I’m still exhausted, and with such lovely memories of the trip. One of my favorites of all time…. And now back to the grind! The groups continued working today on their different ‘products’. Chaka’s group will be ready with the community map by Wednesday. I spent a little time going over the maps that other groups had done in the smaller group so that the kids could see more how the computer works and what the virtual visit set up is and how the map will play into it. They are doing something more symbolic with the map that looks really interesting. They will make representations of the 3 kinds of lifestyle found in the district – the most ‘pure’, the medium developed, and the city type life. These will be combined into one map and they’ll also add drawings of the different things they saw out when they were surveying to prepare to draw the map. Originally we had worried about letting the kids join other groups but now it doesn’t seem to be much of a problem. Each group has solidified and they all feel proud to be in the group they are in. 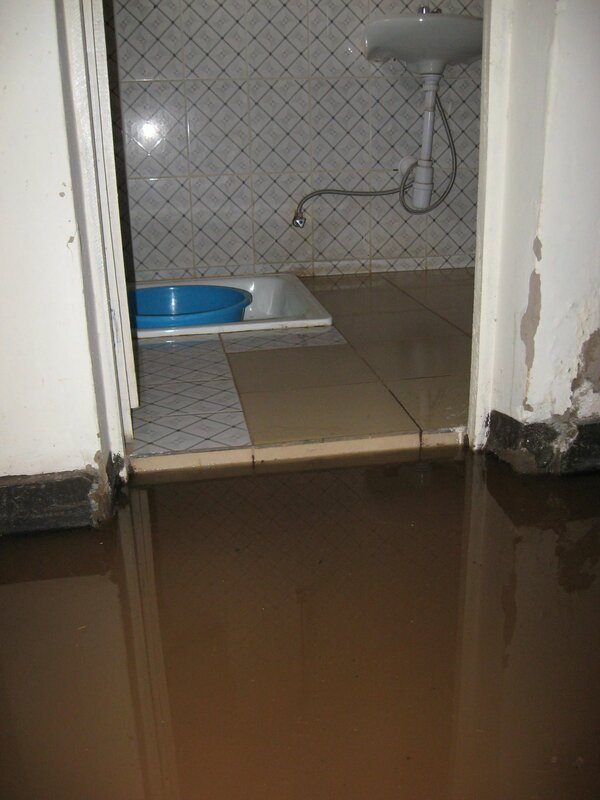 Photo: the rainstorm flooded my hotel room! The theater group practiced with a dress rehearsal and we planned to film it but there was a huge rainstorm in the afternoon and we couldn’t go out to film. The video guys continued editing and filming, but we are still having some computer issues and the kids were not able to learn much editing today. Tomorrow is my last day here…. 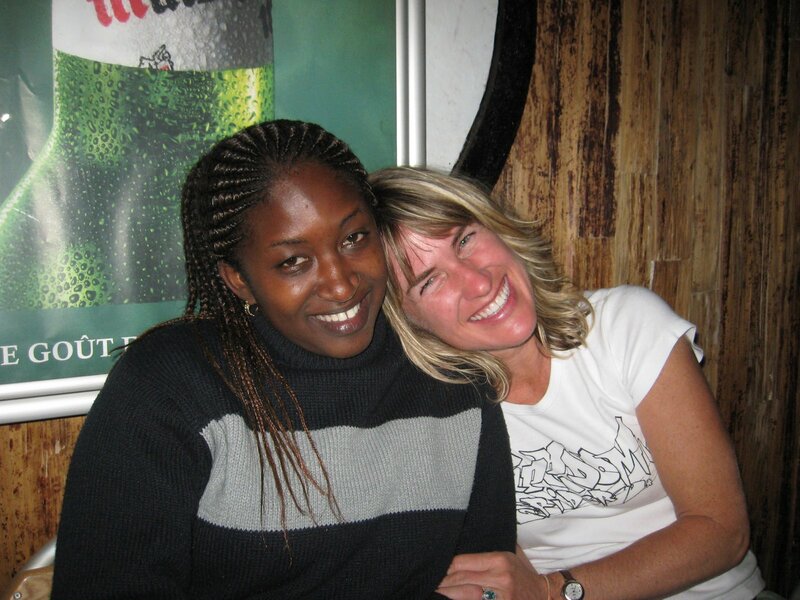 Photo with Chrystel, the Rwanda project coordinator. We set up the sound system in the hotel courtyard and had a big farewell party in the evening. Photo: Bernard and Chaka setting up the music for the evening. People went around and said good things to each other about how great it was to work together, etc. It was a really nice time. I’m really sad to leave! Photo: Joseph, my faithful friend and translator, and Patrick saying lovely things about me…. We arrived a bit late this morning. We brought over the desktops and set them up in the training center so that they could start editing today. The Country Director (CD) arrived around 10 and visited each one of the groups and talked to each of the partners. He seems quite happy with the project and open to the necessary follow up with the kids and through the partners. I was really happy about that. We relaxed most of the rest of the morning and after lunch I worked on some reporting. The arts group went back out to do some more community surveying. 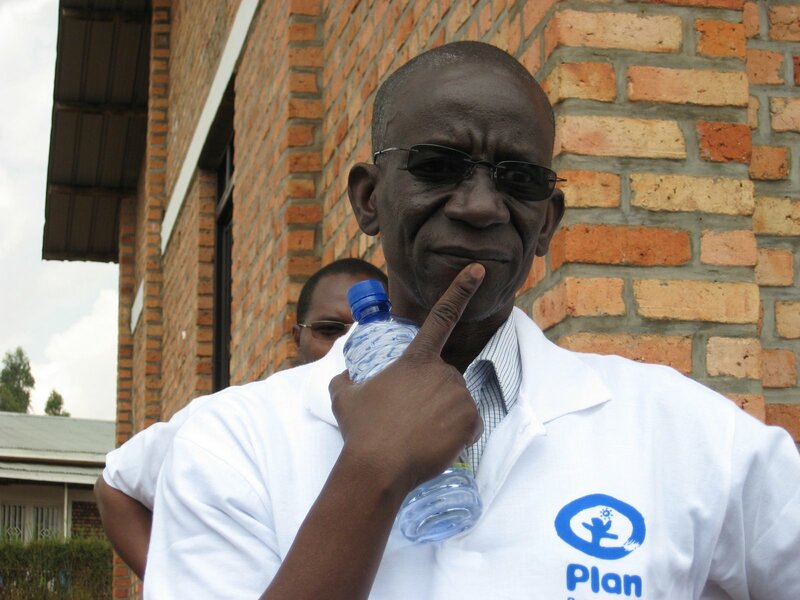 Photo: Mamadou Kante, the Plan Rwanda Country Director. The main issue today is that the electricity was coming on and off which made it hard to work. The country office will send us a UPS that we’d accidentally left there for each computer for tomorrow morning. Photo: Saide, Jacques, Lauben and Bernard. The monitoring and evaluation coordinator visited along with the CD and had a chance to talk with the different partners about sustainability of the project and follow up. Some good ideas came out such as how to respond to the kids requests for forming an association and how to offer them other kinds of training or good follow up and more depth on the skills they are learning in this workshop. 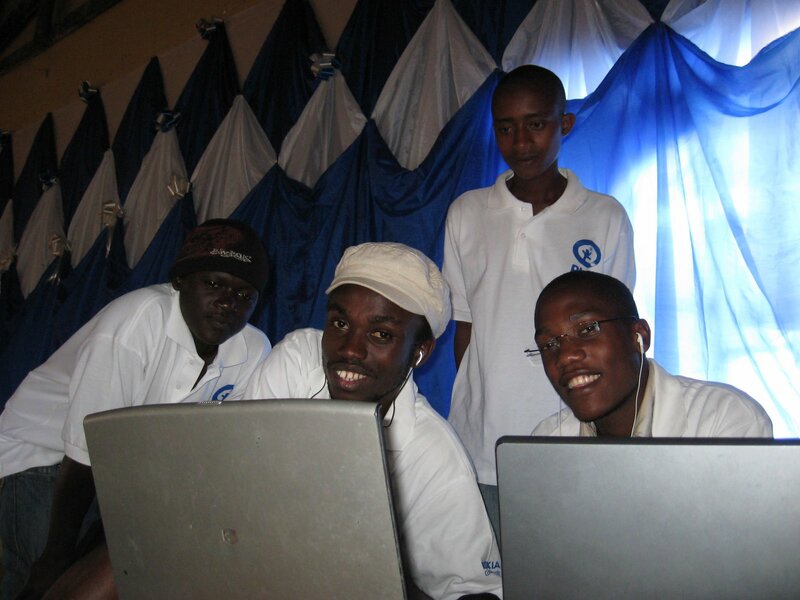 One idea that is coming up from different sides is that it could be possible to open some kind of training center in the area, managed by partner organizations, to house the equipment and conduct further training in the 3 areas plus areas that the youth identify during follow up planning. Photo: the theater group getting ready show their work to the CD. It was quite a good day and I feel like the follow up with all the partners will really happen. At the debrief, people were happy with the results of the day. Amina said that the theater group had stepped it up somehow and all the issues with the play were resolved. Today we had transportation so I went with the 2 video groups to film in the community. Olivier and Bernard went with one group to film one topic the kids had that was ‘we are developing and progressing, so they filmed different things that they see as progress. I went with Jacques and his group, along with Joseph for translation. We drove quite a long way with 21 people in the minivan. Bernard showed me the half-hour t.v. show that he does every Friday called “B-Kool” which covers fashion, music videos, and what’s cool. He showed me also some of the latest videos he’s made, one included Chaka as an angry father who beats up a guy for going out with his daughter. Photo: the video group for today. Our group got out first and we filmed the dam which irrigates the rice paddies, and then Joseph and I stayed near the dam caretaker’s house while the others went off to film a couple other stories, like rice growing and fishing. We ended up waiting for over 2 hours for them to come back. But mainly Jacques figured that if I went, we’d get the crowd following me shouting muzungo again. I think this time it wouldn’t have happened and I would have liked to have gone, but it was also nice to stay up and sit outside for a few hours enjoying the fields, weather and sunshine. Around 12 the caretaker came out with a bowl of amazing food – cooked green bananas, beans, carrots, a small squash type vegetable all in a mild chili sauce. So delicious. Joseph and I shared it with the 2 girls who had stayed back with us. 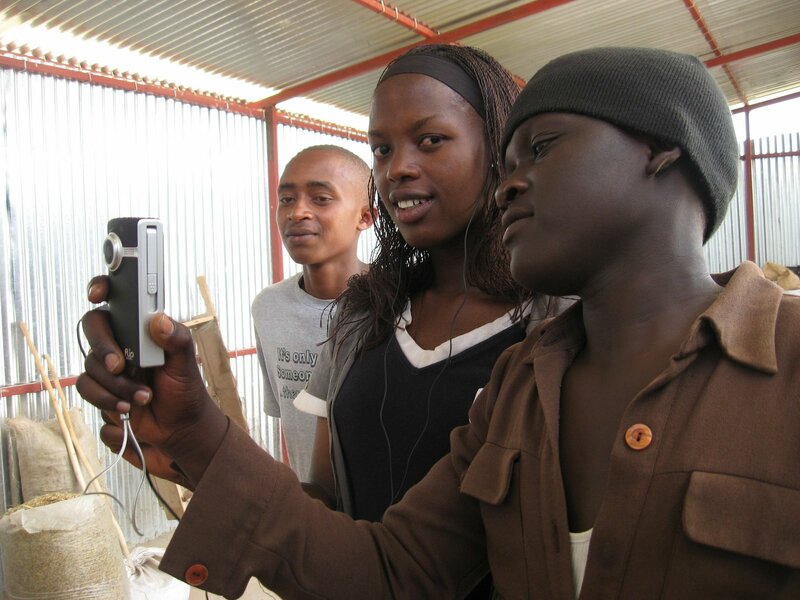 Photo: filming a rice grower in the storage shed. Finally the group came back and reported on what they’d been filming, and that they had lots of great footage, with just one problem – that they’d dropped the camera in the water…. But Jacques figured it would be OK (and it was). We sat for another hour or so waiting for the car to pick us up and I learned a whole bunch of phrases in Kinyarwandan which was cool. Photo: fisherboy. In the afternoon we mainly sat around while the groups worked. I met with Patrick from PAJER to learn more about what they are doing, and to talk about some things we could work on together and possibilities I had thought of for places/people I could connect him with, including possible ideas for collaboration with Plan. We broke at 4, took naps and met again from 7-9.30 to plan for tomorrow. We are still adapting the schedules for the different groups. Amina still felt her group wasn’t progressing as she had imagined, so different people were giving her advice. We reminded her that the goal is not having perfect theater students, but using theater to support expression, and that if there was something that the students were able to do that she should focus on building that up, not on making a long play. Chaka explained how he’s making the map. It will be stylized showing the 3 different zones of Kiziguro – the very rural/not developed areas, the semi-developed areas and the town area. They are also working on drawing pictures of the things they have seen when they are out surveying for the map. Tomorrow the country director is coming to visit around 11. We decided to have the video group focus on some photographing around the training center, the arts and theater groups would continue working. In the afternoon we’d have a debrief of all groups and the kids would move into new groups for Thursday. We decided yesterday to only take what we need to the training center instead of lugging tons of stuff over there every morning. The kids were in groups again today, and in the morning they worked out a plan for what they were going to film and then around 11.30 we started out. I went with Jacques and about 7 kids. 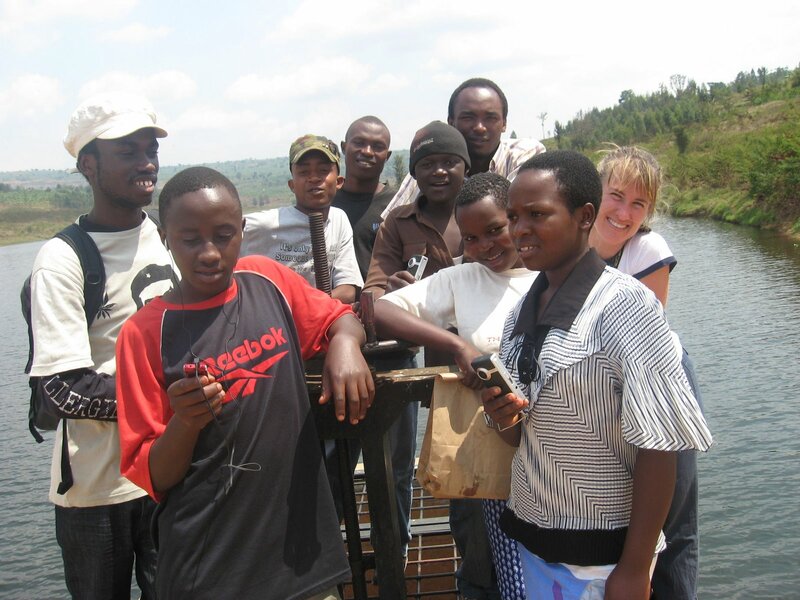 We ended up walking to Lake Muhazi (where we’d spent the weekend) but reaching it from a different side, which took about an hour, and taking pictures along the way. The walk was along a very clean and well kept up dirt road with squarish adobe houses along the way. It was a bit uncomfortable in a few places as we gathered quite the posse of kids following us saying muzungo (white person) the whole way. It was pretty alright until we got to the primary school, which unfortunately was on break time, so then they followed us (well, me) for a couple miles saying muzungo, muzungo. A couple adults came out and took a picture of me which felt strange but I readily accept – it’s a 2-way street. 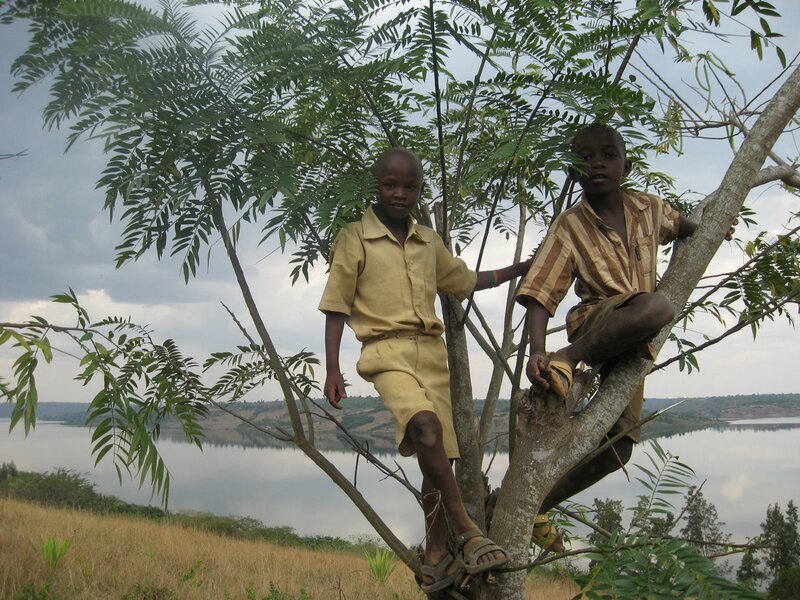 Photo: kids in the trees next to Lake Muhazi, taken by the video trainees. At the lake the kids did an interview of one of the girls in the training explaining how they use the water from the lake for everything. You see lots of guys on bicycles with yellow jerry cans everywhere bringing water for cooking and washing. And you understand why not much washing is really done since the water is so scarce and from so far away. After the interview, we sat awhile waiting for someone to come to collect water so we could film it. It took awhile because it started raining (pretty gently) and I guess it wasn’t really water gathering time. Some cows came along so they interviewed the herders. Then a boat came across the water from the other side so they filmed that and interviewed the water taxi people, and people riding on the boat. Then finally some of the school kids who´d been trailing me came back with their jerry cans and went swimming and got some water, so the kids filmed that and we started the walk back. 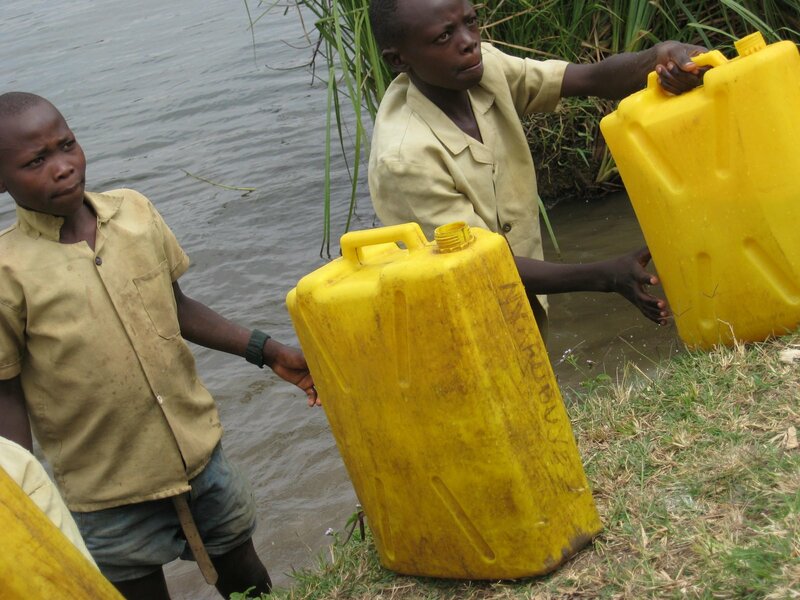 Photo: kids collecting water. Taken by the video trainees. We came upon a wedding so we stopped and took some pictures and film of that too. Then Jacques said we should catch bikes back to the training center so we wouldn’t have to walk – it was already 2.00 and we’d missed 1.00 lunch. It took awhile to find 10 bike driver guys, and they all wanted to carry the muzungo. We finally had all 10, but then they upped the price, so Jacques decided we’d walk. And so we started walking. 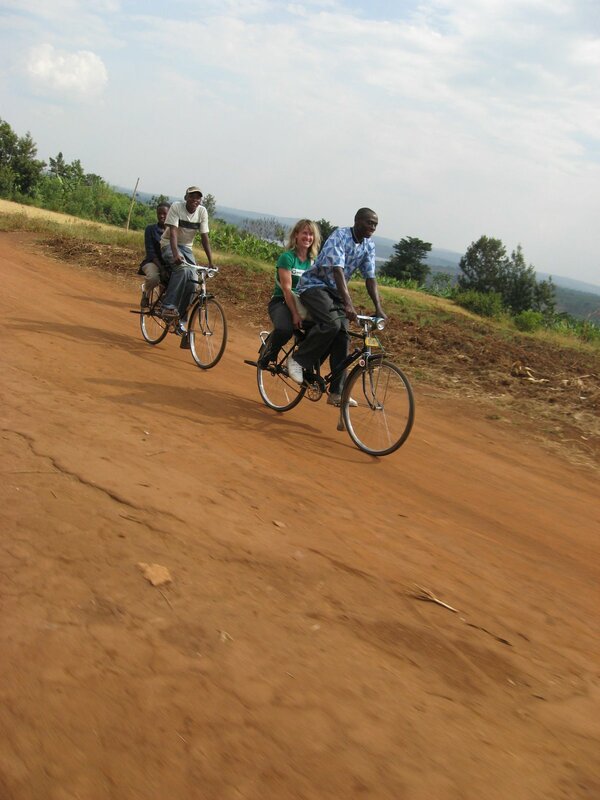 After about 10 minutes of the guys on the bikes following us as we walked they agreed to down the price to 200 Rwandan francs (like 50 cents in US dollars) each. They still all wanted to carry the muzungo, and finally Jacques told them ‘great, you can carry her, but she’s not paying’. He told me not to go with this one guy who’d been a bit obnoxious and found another one for me to go with. And we started out, 10 people on the back seat of 10 bikes with our drivers carrying us along the red dirt road, over potholes and up and down hills. We rode for something like 30 minutes before getting back to the training center. Along the way all I could hear was people shouting out muzungo this and muzungo that to the guy taking me. I could only imagine what they were saying. It was nice though despite being a main attraction. The breeze, the quiet little town with plantains and mango trees on all sides. I like this place. Photo: me on a bike! We got back and they still had some lunch for us – yay! The 2nd film group got back about 10 minutes after we did, and the first thing Olivier said was that if I’d seen where they went today, I’d ask him to take me on a picnic there. They went to see the palace of the traditional king from the area. They got a tour of the place and interviewed him, etc. I can’t wait to see the footage. He and Bernard were quite impressed. They got about 4 stories out of it they said. So together with the water story, potential wedding (if they got good footage), their 4 stories, and the films (to be taken later) of Amina’s theater group, we’re well on our way. We’ll film again tomorrow morning and then start editing in the afternoon I think. We went straight back to the hotel at 4 as everyone was tired. We met at 7 to debrief and plan for tomorrow. Some of the issues that came up were related to logistics – we walked for an hour to get to the place to take the video, and hopefully tomorrow there will be transportation…. The drama group isn’t progressing as quickly as Amina would hope because some of them have poor reading skills and they can’t remember lines. We are starting to pull together the report of what we’ve done up to now, and what we’re planning to do for the rest of the time to ensure that we meet all the goals. We attempted breakfast at the hotel but it was more eggs which Chrystel couldn’t really deal with, so we got ready and walked over to the restaurant that we’d been at last night and sat out on a table on the dock over the water for most of the day, having a big lunch and listening to music and just relaxing. We went for a boat ride on the lake as well before going back to the hotel for a nap and then going back out to the restaurant again. 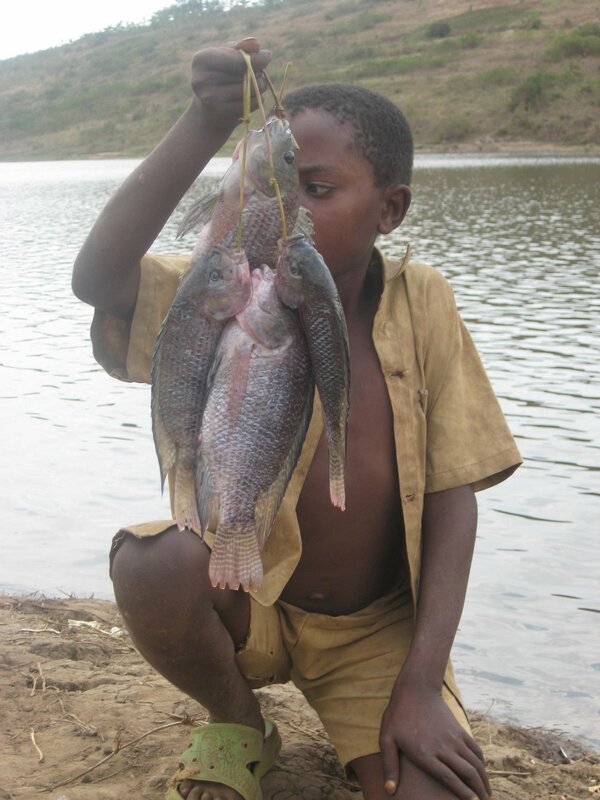 Photo: Lake Muhazi. Olivier came back from Kigali, and now we also had Brian, Chrystel’s friend from Uganda, with us. We danced all night to Conogolese, Ugandan, and Rwandan music, taking pictures. The next morning there was no water and we were all very tired. We went over to the restaurant for a long lunch and then back to the Kirimuruzi hotel for a 2.00 meeting to get ready for the week ahead. Photo: dinner! The main thing for this week is getting the 3 areas (arts, media and video) to come up with a full schedule to meet the ‘production’ goals for the website. We also had some logistics to deal with, like getting transportation for the crews that were going to be making the map of the area (the arts group) and the ones who would be going out to shoot video. That plus the bathroom situation at the training center is abominable. We are supposed to be getting someone to clean a few times a week. 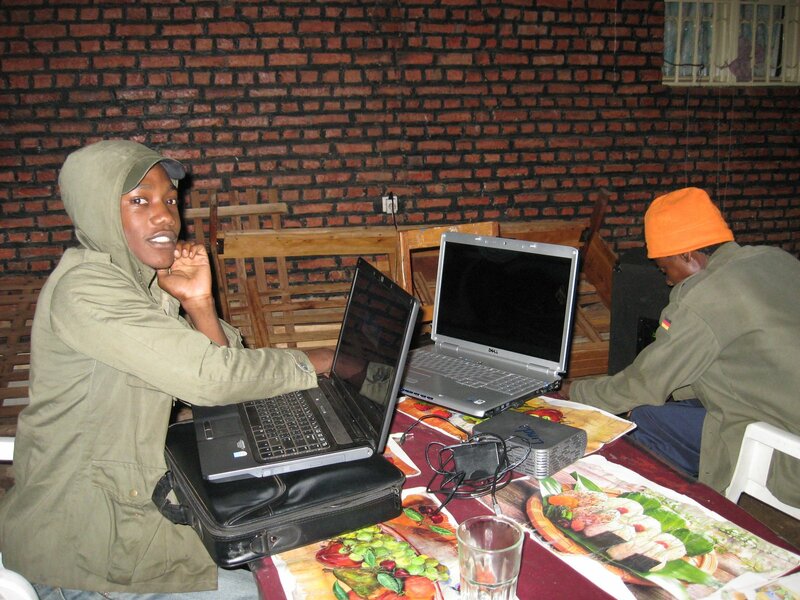 Chrystel went back to Kigali to take care of some more logistics and the rest of us went to bed around 10. The electricity in my room is out so it’s candles now. I’m alternating hair washing days since the cold water is a little harsh in the mornings. It’s been interesting getting ready every morning with just a tiny compact size mirror. Wonder how I’m actually looking as I haven’t been able to see my entire face for the past week! 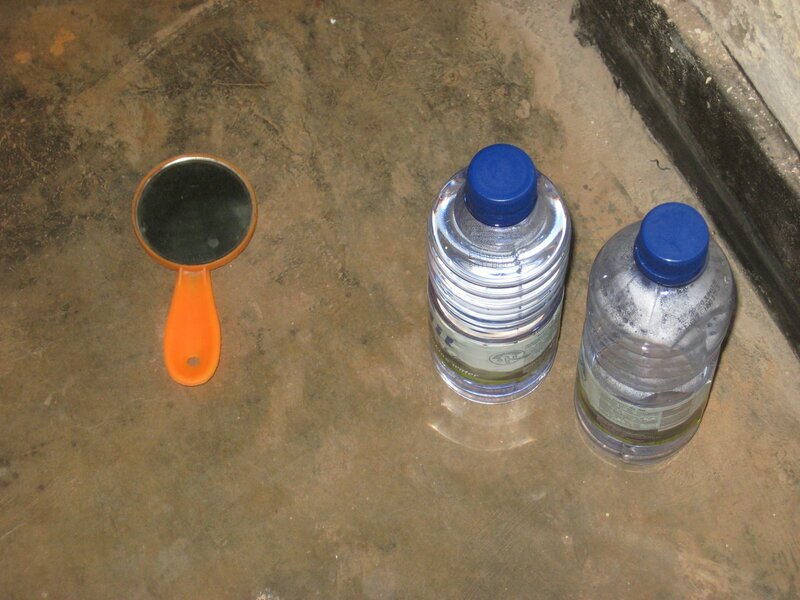 Photo: my mirror and essential bottled water for teeth brushing. Training was easy for me today as the kids were all in their groups and I could just float around to see what each group was doing. In fact I took a couple of hours as a break before lunch because I felt like I was kind of in the way. The kids stayed until 4, working on the script for the play, learning more about video shooting, angles, etc, and doing some prep work on map drawing. Photo: Bernard training the kids on angles and framing. 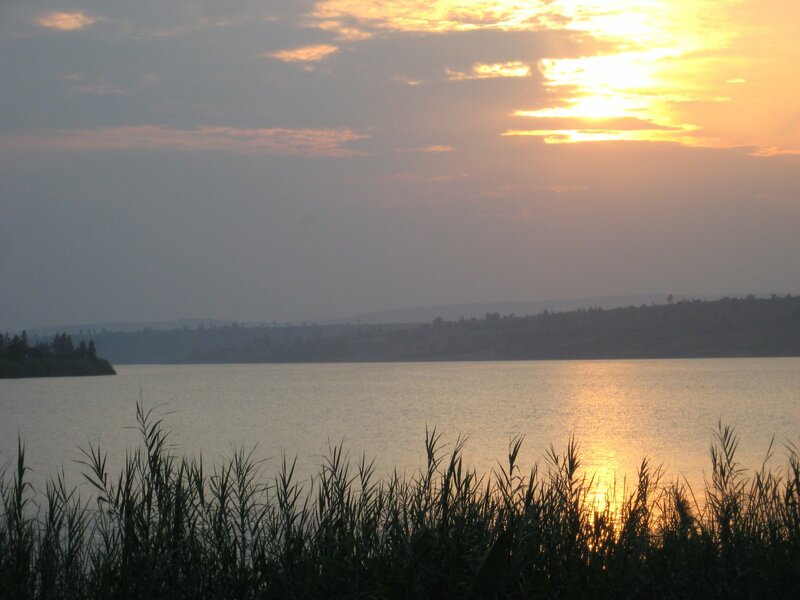 We loaded up all the equipment and took it back to the Hotel and then we packed up and were on our way to Muhazi, the very beautiful lake on the borders of which President Kagame has his ranch. The rooms were really quaint, and we had 2 lodges. Around 8 we walked down the pitch dark road to a restaurant on the edge of the lake. 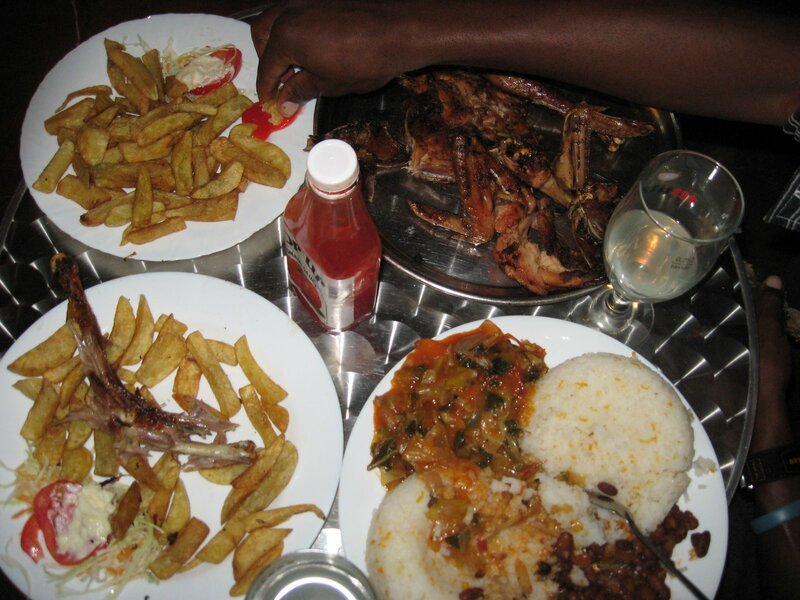 Photo: Amina and I at Jambo Beach, Muhazi Lake Restaurant.